Timothy Hallinan has been nominated for the Edgar, Nero, Shamus, and Macavity awards. He is the author of eighteen widely praised books, including The Fear Artist, For the Dead, Crashed, Little Elvises, The Fame Thief, King Maybe, Fields Where They Lay, and Herbie’s Game, which won the Lefty Award for Best Humorous Mystery. After years of working in the television and music industries, he now writes full-time. He divides his time between California and Thailand. 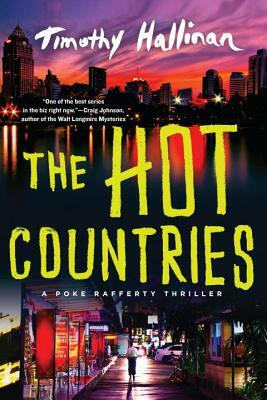 "Fans of the series won’t want to miss [The Hot Countries'] violent conclusion." "Hallinan’s latest in the brilliantly conceived Poke Rafferty series starts with menace and never lets up." "A beautifully written, fully imagined realm with its hidden violence, ever-present sexual gambits, humid rains and fully developed characters." "If there was any doubt that Timothy Hallinan is one of our best in the constellation of thriller authors, then The Hot Countries should resolve that issue in his favor." "This is a first-rate suspense story, written to keep the reader on tenterhooks. As usual, the odors and sights of Bangkok are clearly described so that one can see and smell them as realistically as feeling the continually falling rain—and, especially, the poignant interactions of all the characters. Highly recommended!" "Poke is a charming protagonist who loves his family and friends fiercely and will do anything to protect them. Highly entertaining." "The characters in The Hot Countries are finely detailed along with their vulnerabilities, tragic flaws, and mutual dependence. Hallinan takes us inside their dreams, nightmares, fears, and hopes, making them larger than fiction. They are characters that will stay with you." "Deftly adds touching personal details about the lives of his characters amid chill-inducing action sequences."